Among soldiers, it was generally agreed that there were two types of weather in Vietnam: Hot and dry or hot and wet. I can’t argue with that. We either had mud trying to pull the boots off our feet, or dust getting into everything, including our noses. The monsoon season was very impressive. It included torrential down pours and spectacular displays of lightning. I even saw St. Elmo’s Fire once. Even though the heavy rains made us miserable at times, I think lightning concerned me more than anything. Our radar tower was a lightning rod, if there ever was one. Yeah, it was grounded, but there were still multiple cables snaking their way to our radar van. Our radar was of little use during heavy rains. 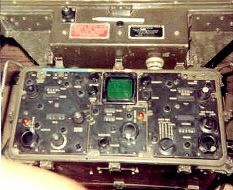 During those moments, we simply put the radar on automatic search and then pushed back from from the console (the lightning thing) and wrote letters home. We had a very close encounter with a lightning strike while based at the ARVN Basic Combat Training Camp near Ben Soi. The ARVN trainees trained during the day and pulled for-real guard duty during the night (OJT – On the Job Training). We got hammered with monsoon one memorable night. Thunder and lightning everywhere. Then BOOM, a lightning bolt struck about 150 feet from our radar tower. As it turned out, the lightning bolt hit a guard firing position on the camp perimeter, electrocuting a trainee. There was a Vietnamese Funeral the next day. I still find it amazing that the lightning bolt didn’t hit our 84 foot radar tower close by. Fate takes endless turns. 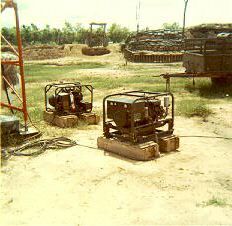 The 3KW radar generator is in the foreground and the 1.5KW radio communications generator is in the background. 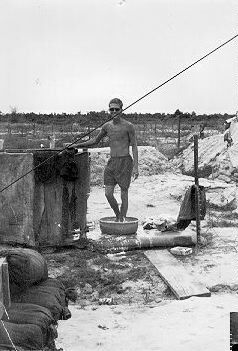 This a photo of me washing my uniforms while based at the ARVN Infantry camp near Loc Giang and adjacent to FSB Jackson. Typical Fire Support Base. 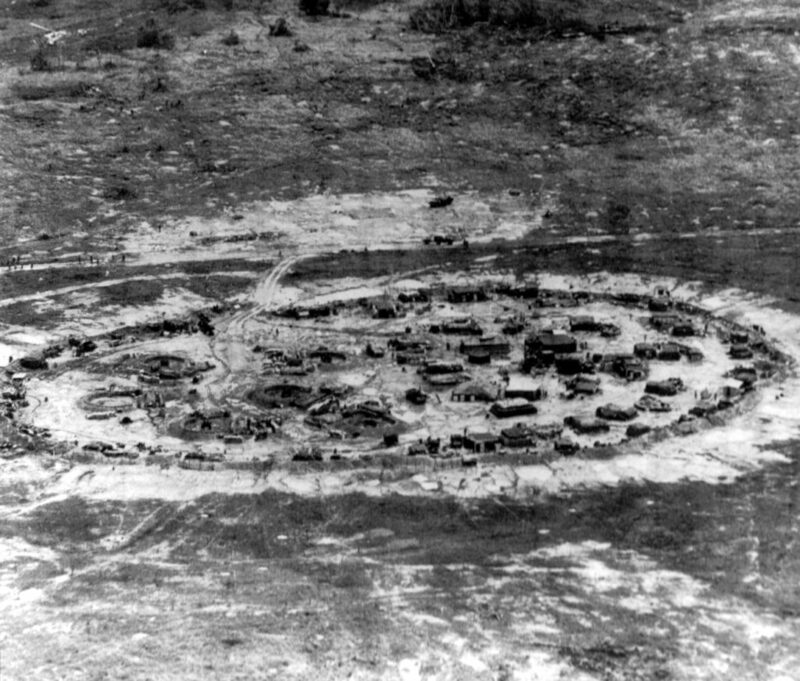 Six 105mm Howitzer gun pits can be seen on the left side of the base, plus multiple firing positions around the perimeter. This base happens to be FSB Crook. We spent 2 weeks there, around the end of June, 1969. Crook was a wild place. Our battery lost Captain Girardot two weeks later in a UH-1 helicopter crash during a night insertion operation in Tay Ninh Province. Two other soldiers were lost as well. A very sad day. Early in December of 1969 I was recommended for promotion to Specialist 5 (E-5, NCO). I caught a ride on a UH-1 helicopter from our Fire Support Base near the Cambodian border back to our Artillery HQ Battery at the base camp near Cu Chi. There, I faced a promotion board consisting of our radar section officer (CWO-3), our Battery commander (Captain), our 1st Sergeant (E-7) and a Staff Sergeant (E-6). I had studied hard, so I sailed through the deluge of questions without any trouble. I recall our 1st Sergeant getting a bit irked with me because he failed to trip me up with his multitude of questions – I answered every one correctly. After the promotion board ordeal was finished, I headed off to a nearby mess hall to get a rare hot meal. It was late in the day, so I had to stay over night in the HHQ Battery area. I did not mind being out of the field for a bit, plus I would also enjoy a rare hot breakfast in the morning. Right after breakfast the next morning I caught a ride back to our fire support base on an OH-6 Loach helicopter. The OH-6 has four seats and is basically a little hot rod when compared to the larger helicopters such as the UH-1 and CH-47. Up front with the pilot was a Captain from our battery by the name of Frank Girardot. He was an Army Reserve officer. I never was sure what his job was or even why he was on this flight. I sat right behind him on the right side of the aircraft. I noticed that he had an M-79 40mm grenade launcher draped across his lap, which I thought was a bit odd. So, off we went. This flight involved many stops at various Fire Support bases so the pilot flew low, rarely climbing above 100 feet or so. Most of the time we were right on the deck, perhaps 20 feet in the air. There was a lot of desolate landscape between the FSB’s and little sign of any people. Then suddenly a little shack appeared ahead and slightly to our right. Much to my surprise, the Captain brought up the M-79 and managed to put a round right through the doorway of the shack as we whizzed by at 100+ MPH. The target was so close the 40mm grenade exploded almost immediately. I looked back to see if the tail feathers were still attached to our helicopter. I’m thinking man, that was a little too close for comfort. Fortunately, the good Captain did not fire his M-79 for the remainder of my portion of the trip. I was really glad to get off that helicopter after we set down at our camp. I received my new Specialist 5 insignia 3 weeks later. My promotion included a $40.00 per month raise, raising my monthly pay to a whopping $260.00 per month, including the so-called “Hazardous Duty” pay. Man, I’m in the chips now! (Not really – I sent 95% of my pay home to my new bride). 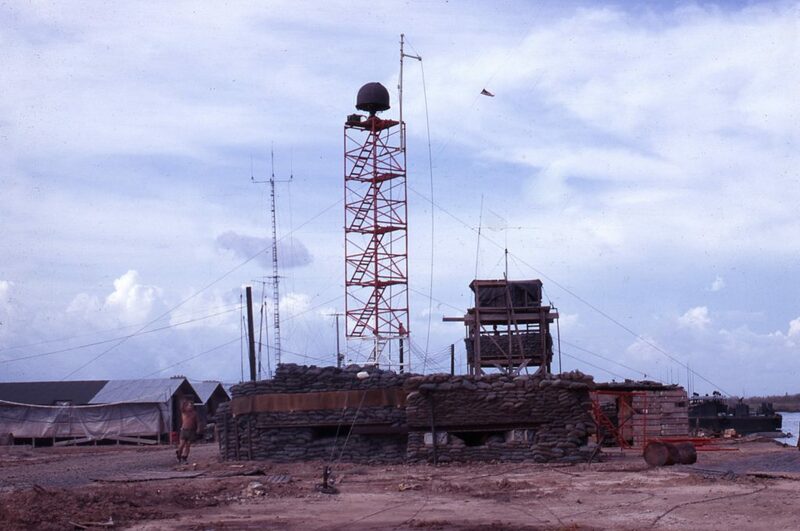 This is one of only two known pictures of our radar tower while at Tra Cu. We set up this tower during the hours of darkness, finishing sometime around 2:00 AM. We were absolutely exhausted by that time and started making stupid mistakes, one of which could’ve caused the tower to tip over. The other mistake was forgetting to ground the generator which resulted in me receiving a heck of an electrical shock the next morning while I was checking the fuel level in the adjacent 55 gallon barrel.